If you are reading this, you have probably heard other musicians talking about these weird scales that seem to all end in "ian" (Dorian, Phrygian, Mixolydian). You might have heard several things about them and are a bit (or completely) confused. The problem with the modal subject is that there are many ways to approach it. Mastering modes implies that you have mastered a series of simple musical concepts. Modes are not that confusing, but do demand from the apprentice to have all these smaller musical concepts assimilated. Your confusion most likely comes from the fact that you have gathered a bunch of pieces of information from different sources. All these little nuggets of information are probably valid, but because they were acquired from various sources, putting everything together can be difficult. The purpose of this article is to organize these concepts with method in order to give you a global good understanding of what modes are and most importantly how to use them in your own playing. Simply put, a "mode" is another fancy word for "scale." A scale is a series of notes that differ in pitch from each other organized in a logical order. Because of the immense number of different ways to combine notes together, the number of modes available can be quite overwhelming. That being said, it is not necessary for a guitar player to know all of them in order to master the subject. However, understanding how they are built is crucial if you want to improve your phrasing and develop new ideas. In order to get the most of this article, you will need to have a good understanding of what intervals are. If you are unsure about what intervals are, I strongly encourage you to study my previous article called "practical ear training" which will bring you up to date and facilitate your modal study. Before we dive into the modal subject, let's talk a little about pentatonic scales. Just like its name implies, a pentatonic scale is a scale made of five notes. We'll use two commonly used pentatonic scales as a "skeleton" on which we'll build our study. The two pentatonic scales we will use are called the major pentatonic and the minor pentatonic. They will work over a major or minor chord according to their name. Most of the modes you'll encounter in your journey are diatonic modes (7 note scales). The beauty of modes is that most of them are constructed on the two pentatonic scales we discussed in the previous chapter. Since our pentatonic scale formula has five notes, we only need to add two extra notes to get a full diatonic mode. By now, you should know the formulas of these two pentatonic scales. According to thee formulas, we will need to add some type of second and some type of sixth to our minor pentatonic scale. In a similar way, we will need to add some type of fourth and some type of seventh to out major pentatonic scale. Let's talk about three very commonly used minor modes constructed on a minor pentatonic formula: Root, minor third, fourth, fifth and minor seventh. Let's talk about three very commonly used major modes constructed on a major pentatonic formula: Root, Major second, Major third, fifth and major sixth. Now that we defined what modes are and discussed several commonly modes in the major and minor family, let's talk about how to use them. As you should know by now, scales give you the opportunity to add color to your music. Each scales have their unique sound and will help you create different moods depending on where you want your music to go. You might be wondering how to know which modes will sound good over a particular chord or chord progression. The answer lies in the formula of the mode you are working with. The idea is to find a scale formula that will match the formula of the chord(s) you are playing with. Let's consider the following simple scenario where you need to pick a scale that will work over the following single chord: Gm. The first step we need to take is to look at the notes used to form a minor chord. These notes are as follow: Root, minor third (that note tells us we are dealing with a minor chord) and a fifth. These notes give us clues as to which modes can work. In this particular case, we will need to choose modes that have a root (they all do), a minor third and a fifth. If we look at the formula of the previous commonly used modes we see that we can use the Dorian, Phrygian or Aeolian mode here. These three modes all include the notes of the chord we are trying to match to a scale. 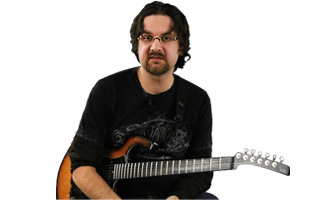 We couldn't use an Ionian, Lydian or Mixolydian scale because they have a major third. That major third would clash with the minor third of the chord. Once you understand this simple concept of matching the mode's formula with a chord's formula, things become quite easy. That means that the more notes included in a chord, the less options you will have when picking a mode. Just remember to take into consideration all the notes of the chord you are dealing with. You might be thinking that songs are usually not built around a single chord, and you are right! When dealing with more than one chord, the process is the same. Let's see how we can deal with such situations in the following example. Now let's organize these notes in alphabetical order starting from the root of the first chord encountered: A B C D E G.
The scale that we spelled out does not include any type of F. That is where your liberty as a player comes. You may pick whichever type of F you wish: F or F#. Notice that I did not consider F flat as an option as Fb and E are the same exact notes. If you apply this method to any chord progression you encounter, you will be able to play in any given situation. If you encounter a chord progressions in which you encounter the same note with different accidentals (for example F and F#), you are dealing with a modulation. A modulation is simply a change of key in the same song. In that case, simply apply the previous technique taking note of where that key change occurs. As you should know, the guitar is built in a way that it is possible to play the same exact note on different areas of the fretboard. That explains why modes can be played in many different positions. The suggested positions discussed above were chosen because they are conveniently built on top of the commonly used pentatonic shapes. Being able to play the previously mentioned modes all over the fretboard will help you create new musical ideas as you won't be tied to a unique position. The following technique will help you in that matter. Here is how you can use that trick. If you are playing in a G Ionian position, you may expand your fretboard coverage by playing in an A Dorian position. 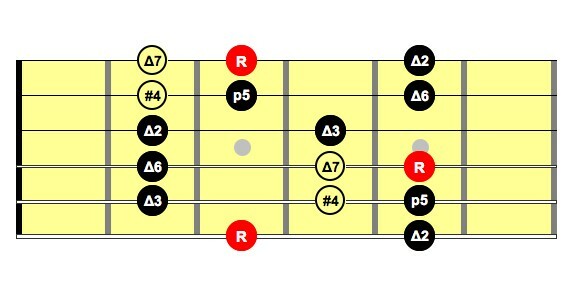 All these modes simply follow each other on the fretboard. You might have noticed that the previous rule of modes being related to each other omitted an important point. That is that the modes we are dealing with are diatonic, meaning they are seven note scales. Since all modes follow each other, they start on each of the notes of whichever mode you are using as a reference. We only discussed six modes. Let's talk about that seventh mysterious mode. Root, minor second, minor third, fourth, diminished fifth, minor sixth and minor seventh. Did you notice the diminished fifth in there? The diminished fifth also known as the tritone is quite an interesting interval. It is known to be a very tensed interval. That gives the listener a feeling of no resolution. It is of no surprise that this interval was banned in the early church as it was thought to be the devil's interval! The Locrian mode will work perfectly over a m7b5 chord (Root, min 3rd, b5 and min 7th). The musical principals described in the previous chapters should give you a general good understanding on what modes are and how they can help your playing. The seven modes covered are only a few of many many more. The ones discussed are part of the Major scale system (they all are related to each other according to the Major scale formula). You might have heard of them referred as the church modes. As you develop new modal ideas, you might want to consider exploring the modes from the following two systems: the harmonic minor scale and the melodic minor scale. Taking the time to study these modes will put you ahead of the game and should give you a very good set of musical tools to chose from when creating music. As you are studying modes, I strongly recommend that you practice them over custom made backing tracks created specifically for the mode you are trying to master. Doing so will train your ear to hear the difference between these scales. JamPlay's backing track section is full of excellent tracks you may use while working on this. Practice well, don't burn any steps, and ask questions! Doing so will help you master the wonderful concept of modes and ill help you express yourself more efficiently on your instrument.